runs for election come 2019.
said, his wife, Aisha, belongs to his kitchen and that he doesn't knows which party she belongs to. Chancellor Angela Merkel, standing at his side, to give him a short glare and then laughed. 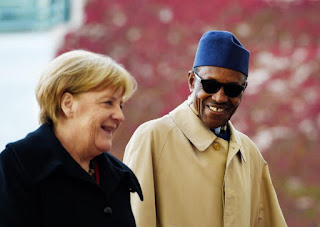 Recall that in an interview with BBC Hausa-language service broadcast Friday, Aisha Buhari had said that her husband did not know many top government appointees in his cabinet. husband’s party, the All Progressives Congress party. Although she did not mention any names, she however asked people to watch out for them on the television programmes. Buhari, who was a military dictator in the 1980s, was elected in his fourth run at the presidency in 2015 on the back of a coalition that includes former foes and opportunists who abandoned the former governing party of defeated President Goodluck Jonathan. Buhari has not said weather he will run again in 2019.
campaign again and ask any woman to vote like I did before. I will never do it again,” Aisha Buhari said. knowledge over her and the rest of the opposition, because in the end I have succeeded. negotiated release of 21 of 218 Chibok schoolgirls kidnapped by Boko Haram in 2014.